WORLDWIDE: Corporations signed off-take agreements for a record volume of clean energy last year, with the lion's share of renewable power purchases taking place in the US, according to new analysis. Bloomberg New Energy Finance (BNEF) found that 43 corporations in ten different countries signed power purchase agreements (PPAs) for 5.4GW of clean energy. This was up from 4.3GW in 2016 and a previous record of 4.4GW in 2015, analysts noted in BNEF’s inaugural Corporate Energy Market Outlook. Wind accounted for most of power bought through PPAs last year, representing 2,821MW (86.9%) of energy bought by the world’s top ten corporate off-takers. Corporate PPAs are becoming increasingly popular, BNEF analysis suggested, with 76% of the 19GW of clean power bought since 2008 purchased in the last three years. The analysts noted PPAs were increasingly being signed despite a persisting "tumultuous political climate and cheap wholesale power" in the US, and despite uncertainty about whether such power deals are legal in some European countries. BNEF also expected ‘regulatory barriers’ to corporate PPAs in Japan and China to be removed. "The growth in corporate procurement, despite political and economic barriers, demonstrates the importance of environmental, social and governance issues for companies," said Kyle Harrison, a corporate energy strategy analyst for BNEF. "Sustainability and acting sustainably in many instances are even more important, for the largest corporate clean energy buyers around the world, than any savings made on the cost of electricity." Corporate PPA volumes in the US reached 2.8GW in 2017, with 39 corporations signing their first offsite power deal. However, the new tax bill enacted by Congress and signed by President Trump is expected to "slightly inhibit tax equity investment" as it creates uncertainty for equity investors as to their ability to use the full extent of clean energy credits, BNEF noted. Nevertheless, US corporations signed big deals for wind power last year. In December, technology giant Google announced it had signed PPAs for 536MW from wind farms in Iowa, South Dakota and Oklahoma owned by EDF Renewable Energy, Iberdrola subsidiary Avangrid Renewables and from the Grand River Dam Authority, while, a 253MW wind farm providing Amazon with its largest PPA to date was commissioned in October. General Motors bought 200MW of output from two wind projects to power manufacturing facilities in Ohio and Indiana, while Kimberly Clark — the corporation behind Andrex, Huggies and Kleenex — signed virtual PPAs worth 245MW with Invenergy and EDF Renewable Energy. Drinks conglomerate Anheuser-Busch bought 51% of the power generated from Italian utility Enel’s 298MW Thunder Ranch project in Oklahoma. Latin America is a historically sluggish corporate procurement market, BNEF stated, but is expected to attract major activity in 2018 and the coming years. In Mexico, private companies can now sign bilateral PPAs with developers, and major power buyers will also be expected to comply with clean energy mandates, once a new certificate market kicks off this year. Meanwhile, large consumers in Argentina can now purchase clean energy directly from developers, rather than just the national utility. Elsewhere, in Chile, where much of the country’s power consumption comes from the industrial sector, and where cheap renewable energy prices have been yielded in the last two years, "mining companies have increased their interest in clean energy to lower electricity costs", according to BNEF. Corporations bought 1.1GW of clean energy in Europe, the Middle East and Africa (EMEA) last year — slightly down on 2016. 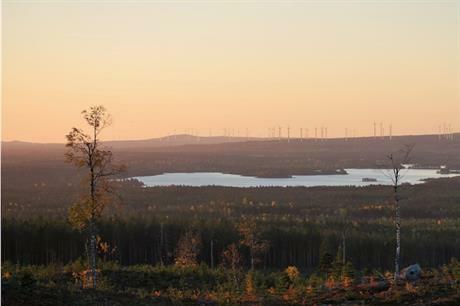 The region is "largely driven by one-off contracts", BNEF stated, including aluminium producer Norsk Hydro agreeing to buy 1.65TWh a year for 19 years from the 650MW Markbygden ETT site. Many US companies that have met renewable energy targets domestically are now turning their attention to Europe, BNEF noted. In the Netherlands, for example, Microsoft signed an agreement with Vattenfall to power a Dutch data centre with all of the energy produced from the Swedish utility’s 300MW Wieringermeer site under a ten-year agreement. However, the European Union’s Winter Package threatens to "weaken demand" by making it so "developers that receive renewable energy subsidies will no longer be eligible to receive certificates, and instead will have to acquire them through a mandatory auction", BNEF warned. Most of the 3.2GW renewable PPAs signed in Asia since 2008 took place in India, BNEF research found. Cheap renewable energy as a result of competitive auctions and an unreliable grid made such power deals attractive. In Australia, expensive wholesale power and the availability of renewable energy certificates incentivised companies locking into relatively cheap renewable prices on a long-term basis. Power deals for more than 430MW were signed last year. The country’s first ‘collective PPA’ — an off-take deal selling power from the 80MW Crowlands project to universities, city councils and companies around Melbourne — is nearing completion. Japan currently has no mechanism for consumers to sign direct PPAs with power generation companies, while China currently limits corporate procurement to onsite projects, specifically behind-the-meter solar projects installed at industrial parks. But analysts expect this to change as both countries are "undergoing power market reforms".